Simpler and more fruit-filled than a coffee cake, but offering more batter than a crumble, buckles are hard to put into a specific category. 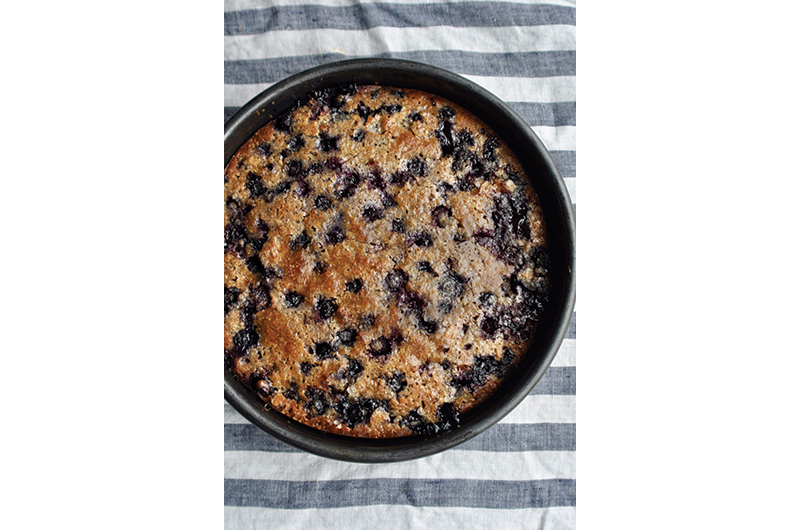 This one is tender, moist, and filled with sweet July berries. Buckles are best eaten on the same day they are baked, but luckily they come together quickly, so you don’t need to plan ahead. 1. Heat oven to 375 degrees. Butter a 9-inch round cake pan. 2. In the bowl of an electric mixer, add butter, granulated sugar, and brown sugar and beat until light and fluffy. Add eggs one at a time to the butter mixture, then add lemon zest, vanilla, and sour cream and mix until combined. 3. In a separate bowl, combine flour, salt, nutmeg, and baking powder, and whisk to combine. Add dry ingredients to wet and mix until just combined. 4. Gently fold berries into the batter, then spread batter in pan and sprinkle with the turbinado sugar. Bake 40 to 50 minutes, or until top is golden and cake is cooked through. 5. Allow cake to cool. Serve plain, with vanilla ice cream, or fresh whipped cream. This recipe was originally published along with the article, Summer Dessert Demystified.